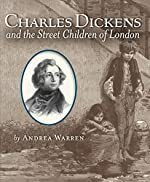 Charles Dickens and the Street Children of London by Andrea Warren. Review: A Christmas Carol, Oliver Twist, A Tale of Two Cities, are all familiar to people around the world All of those books were written by Charles Dickens. If you want to know more about Charles Dickens' life, look no further. Charles Dickens and the Street Children of London by Andrea Warren is a great book. It explains the source of all his book ideas. 1812, Portsmouth, England is where Charles John Huffman Dickens was born. Charles Dickens always wanted to go to school, but his father did not spend money wisely, and a result, he couldn't pay his debt and went to debtor's prison. Dickens sadly couldn't go to school because he was required to work at a factory to help his family pay off their debt. A few years later, Charles Dickens left the factory and went to school. However, he had to quit because his father went back to debtor's prison. As an adult, Dickens got a job as a critic reviewing plays. It was at this time when Dickens' friend told him there was a contest to write a book and the winning book would get published. Dickens decided to write a book, but because he was afraid the public would not like his book so he authored it as Boz. Little did Dickens know he would win the contest and become famous for The Pickwick Papers. Charles Dickens and the Street Children of London chronicles the life of Charles Dickens through his difficult youth and shows how The Pickwick Papers changed his life. I give this book 4.3 star out of 5. Right when I read the first page, I was hooked instantly. This book informs readers about all of Dickens' life. Charles Dickens and the Street Children of London also the condition of poor people in London. In the back of the book, it lists all of Charles Dickens major works. The book also lets you know about Queen Victoria at the time while she ruled. It also lets you know about the legacy of the workhouse and child labor around the world today and how it affects children around the world. In the far back of the book you can see websites and other books on Charles Dickens. However you may not like how the book sometimes goes off topic to other people who helped London's poorest children. Nevertheless, you will want this book. If you have to do a project on a famous person, look no further and read this book on Charles Dickens. You want Charles Dickens and the Street Children of London, buy it NOW! We would like to thank Houghton Mifflin Harcourt for providing a copy of Charles Dickens and the Street Children of London for this review. Have you read Charles Dickens and the Street Children of London? How would you rate it?